The Hamm’s Scene-o-Rama was a sign ahead of its time. Made by Lakeside Plastics in Minneapolis in the late 1960s through early 1970s, it features an outdoor scene with a waterfall and river that appear to flow, as well as a smoking campfire. The motion effect comes an outer, semi-transparent scroll and an inner, vertically lined background that gives the water (and campfire smoke) the illusion of flowing. There are two sizes, small (which is about 3-feet across) and large (5-feet across). The large came in two versions, one with a static, non-moving scene and one with the rotating scroll. The signs all have dimensional, dark brown roof shingles above the scene. I’ve seen people assume all larger signs have motion, so always double-check by unscrewing the casing and inspect the inner workings before you buy one. There are other variations, such as a “round logo” Scene-o-Rama, which has the words Hamm’s beer in a round, white logo panel. This version is harder to find than the typical square logo version. Many urban legends surround the Scene-o-Rama, like a disgruntled artist hiding a profanity somewhere in the artwork of the Northwoods scroll because he got stiffed on payment. Or, these signs are worth thousands of dollars and are incredibly rare. It may be that I’m in Minnesota, and am constantly seeking old beer stuff, but these signs aren’t rare. Desirable, yes. Rare, no. Buying: Unless these signs were boxed up or displayed in a non-bar environment their entire life, they probably sustained some sort of wear or age during their decades of service. Check the underside of the case: Too many people underestimate the weight of a Scene-o-Rama, and the case can crack easily when picked up. Check the roof panels for cracking or corner breakage. How can you tell if its been in a smoky bar? The white side panels will be yellowed as well as the Hamm’s logo panel. Some Armor All will whiten them up. The case removes easily—take the screws out and inspect the guts of your sign. You can clean the logo panel from the front using Q-tips to get between the black lattice. Inspect the scene carefully. Horizontal scratches are commonplace because Lakeside Plastic used screws to hold the clear acrylic cover over the scene—grrr! If possible, buy your sign in person. Internet auctions will generally disappoint, whether it’s through definition (“Mint!”) or delivery (“I thought I packed it well … sorry!”). Replacement parts are available for these signs, and there’s no better feeling than rescuing and restoring an old Hamm’s sign back to its original glory. The motion is truly mesmerizing, and brings back memories of sitting with my dad at our local hamburger joint as a kid. From the land of sky blue waters, I’m Barry the beerguy. I finally got my Grandfather’s 5′ Hamm’s scene-o-rama…The scrolls weren’t turning inside… ..So I got inside of this Jewell and the roller bearings were seized up so I took them off the roller pins and oiled em and worked em until they both were free spinning…Put it all back together and this sign is mint condition. I have asked Stevan Miner about script on my ’65 Rippler. I have located some sort of writing on the RH panel towards the top of the water line about 1/4″ below the forest. I haven’t taken it apart to inspect it; however, there IS something clearly written on the print itself. It’s not on the scroll as it doesn’t move. The lettering is about 3″ to 4″ long. I can make out the letters “..and……”! There IS something there. Were there units with all brown wood look side panels ? I am the owner of a Hamms scene-o-rama that belonged to my mother. It is still in working condition however the Hamm’s name is not there anymore. Is this replaceable? If not, is it still valuable? There are two different sizes of Scene-O-Rama’s and they take different scrolls. The larger version has got about 9 inches more of birch tress. What Lakeside di was just splice this piece in resulting in two seams on the large scroll as opposed to just one on the small one. When I made my reproduction screens I eliminated the one seam in the large version. I have a new in box Starry Skies sign; smaller size. My question is, the name of the lake where the picture was taken..? I read it some years ago, but haven’t been able to find it again. The background metal plate is a stylized illustration done by an artist,not a photo. So it probably exists only in the artists mind. The scene on the Scenorama (above) is also an illustration, not a photo of a real lake. Are African American Hamm’s beer sign rare or low production numbers..Is it a myth that Hamm’s beer had alot of controversy on these signs? Thank you in advance for your time…. They were made for smaller (regional) markets,like Baltimore or Los Angeles and distributed to bars or stores serving ethnic markets/customers. So they were made in smaller quantities. The screws that usually scratch the scroll are the ones on the sides of the Plexi-Glass. When I restore one of these signs, I just cut the Plexi larger and then just use the upper and lower three screws to attach it to the case eliminating the side screws and also the metal bars that hold the original glass in. When I then put the cover on, I lift it slightly tightening the screws midway in their slots to give even more clearance between the glass and the scroll. The new scrolls that I sell are already assembled and ready for installation. Stay away from the products that are being sold by Conscept Graphics. They are junk. Dr. Hamms. I have the 36” scenearama that appears very well and operates nicely with the exception of the blue plastic behind the square Hamms logo is degrading. Is this available? Yes I have this piece for sale. 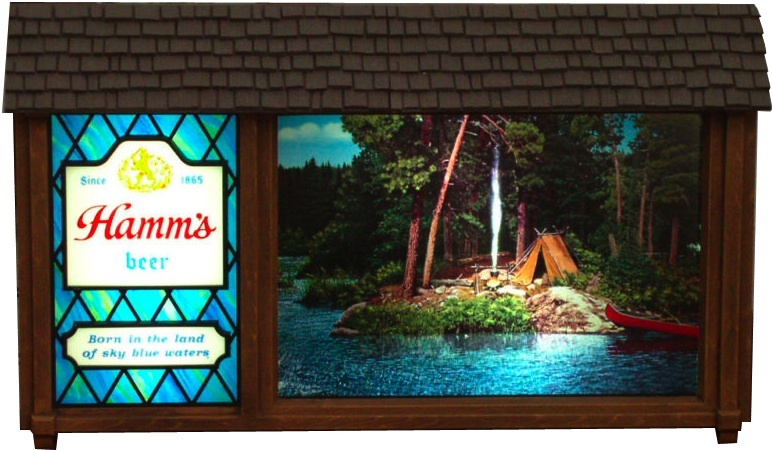 Go to our website http://www.ibuyoldbeer.com for a complete list of parts for this and other Hamm’s Beer signs. it. I tried using a little dish soap and water on it which did get some of the gunk off, but, it dried with a chalky like film on it that can’t be removed. Is the plastic so old that it is blooming out, is there some way to treat the brown plastic to restore it? Hi Dr I have a large sceanorama sign with clock but the clock motor is going bad are they available ?